With over 25 years of experience, Dr. Harburg-Johnson is an experienced and compassionate dentist who offers comprehensive, high quality gentle dental care in her state-of-the art practice. Originally from New York, growing up in Staten Island, Dr. Harburg-Johnson attended New York University and Hunter College (BS Degree in Cellular Biology); graduated from Columbia University's School of Dental and Oral Surgery in 1985. She received an Award of Excellence for Dental Anesthesiology at graduation. While at Columbia, she interned at Hackensack Hospital and Englewood Hospital. After graduation, she completed one year of a general practice residency at Lutheran Medical Center in Brooklyn, New York. She practiced in Brooklyn and Staten Island before relocating to Monmouth County, New Jersey. She practiced in West Caldwell as an associate dentist before purchasing her own practice in Franklin Lakes, New Jersey in 1990. Dr. Harburg-Johnson is a member of the American Dental Association, New Jersey Dental Association, Bergen County Dental Association, Academy of General Dentistry. Dr. Harburg-Johnson has resided in Franklin Lakes since 1993. She is married to her childhood sweetheart and has one daughter, who is a senior at the University of New Haven in Connecticut. When not in the office, she enjoys traveling, reading, swimming, snorkeling and hiking. Also, she is a consummate movie buff and especially enjoys old movies. 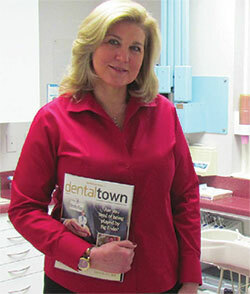 Click here to read more about Dr. Denise Harburg-Johnson in The Villadom Times.